Poker Bet is a fixed odds poker game where you wager on which starting hands in Texas Hold’em you will think will improve to become the strongest after all the cards have been dealt. 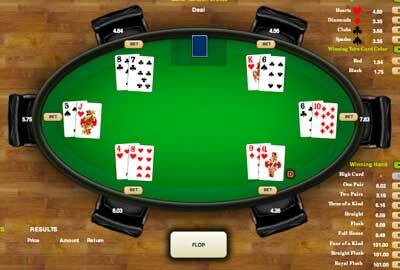 Six imaginary players are each dealt a hand in one game of Poker Bet. You can place bets on which of these hands you think will win; before the cards are dealt, before the flop, and on the flop. After that it’s all down to luck. Note: Poker Bet is like the poker version of horse racing, minus the jockeys (and a lot of other stuff for that matter). Nonetheless, you put your money on your favourite and hope to get lucky. There is no need for bluffing in Pokerbet, although it will be handy to be familiar with the rank of hands in poker and to have a basic knowledge of how the game of Texas Hold’em works. Poker Bet fun rating - 73%. Despite being a fixed odds game at its core, Poker Bet has a strong strategic feel to it. Backing certain cards using your knowledge of the rank of hands in poker makes for a very exciting and interesting game. If you absolutely hate poker, then it’s fair to say that this isn’t going to be your cup of tea. Furthermore, if you’re after the opportunity to win ridiculous amounts of money from relatively small bets, Poker Bet isn’t going to deliver the good there either. Poker Bet is hardly a replacement for a real game of online poker, but it’s still a fun, strategic alternative nonetheless. 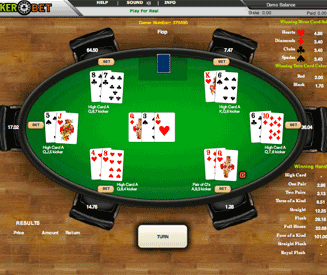 If you enjoy poker but don’t fancy jumping in to a fully-fledged online poker room, Poker Bet is a cool option. 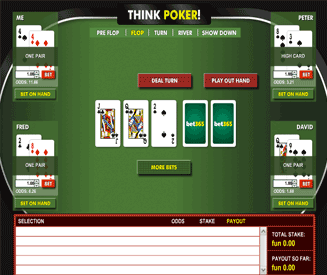 Paddy Power Games offers a variant of Poker Bet called "Think Poker". Both of these games play in almost exactly the same way, so instead of giving Think Poker it’s own review I’m just going to give it an honourable mention here. 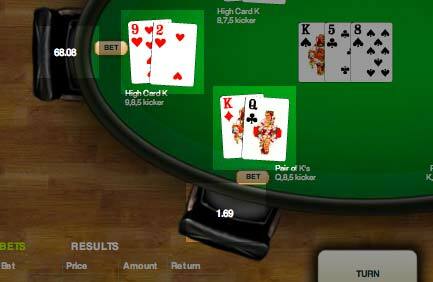 The biggest difference between these two fixed odds poker games is the graphics. Think Poker also has a slightly more flexible wagering system than Poker Bet. But overall, they’re essentially the same game. A quick guide to Poker Bet. You can wager on any of the six different players at the table at the start of the game. 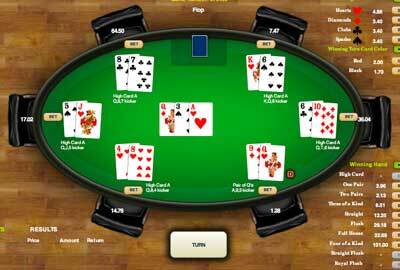 You can wager on any of these players again after their starting hands have been dealt. You can wager on any of these players for one last time after the flop has been dealt. Sit back and hope that the hands you have backed end up winning after the turn and river cards have been dealt. Poker Bet is essentially a very simple game of Texas Hold’em (hence why some games sites call it "fixed odds poker"). Six hands are dealt and you have 3 opportunities to place your bets on which hand (or hands) you think will win the game. 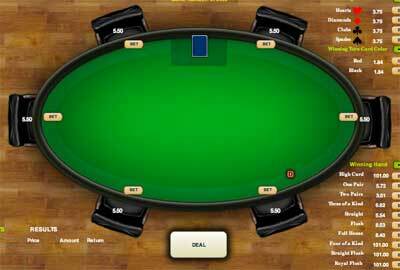 There are 3 opportunities to place bets on hands in Poker Bet. Before any of the hands have been dealt. After each player has been dealt their starting hand. After the flop has been dealt. 1) Betting before any of the cards have been dealt. Betting on this round is total guesswork. It’s just like rolling a dice and wagering on which number you think is going to be rolled. The payouts for each player at this stage are fixed at 5.5x. Note: If you’re in to wagering on simple, completely luck-based games, you may enjoy playing games like Miami Dice and Dice Wars. 2) Betting after each player has been dealt their starting hand. This is where the skill starts to come in. A good knowledge of the best starting hands in Texas Hold’em is also going to be very useful here. The payouts for most hands at this stage are still generally quite high, as a lot can change by the end of the game. Nonetheless, this is your first opportunity to make an educated decision on which players at the table you think have the best chance of winning. Fact: Pocket Aces is the strongest starting hand in Texas Hold'em. 3) Betting after the flop has been dealt. This is your last opportunity to pace bets. It’s also going to be the most informed and (hopefully) accurate decision you make as there are only two cards left to come. As a result, the better hands have much reduced payouts whereas the hands that haven’t made a pair or better tend to have longer odds than ever. Furthermore, hands that have absolutely no chance of winning are removed from the game (well, not removed, but you are not able to bet on them). Betting on the suit of the river card. Betting on the colour of the turn card. Betting on the kind of hand that will win the game. The first two bets are self explanatory. For the third option, you wager on what you think the value of the winning hand will be. For example, if you think the best hand will end up being a flush, you can wager on that. The rarer the hand (e.g. a Royal Flush), the bigger the payout. Payouts for specific players and hands. The better the hand, the smaller the payout. The worse the hand, the bigger the payout. The more chance a hand has of being the best after all 5 board cards have been dealt, the lower the payout will be. It’s also worth noting that hands that haven’t made a pair, like flush or straight draws, can still have low payouts. For example, a hand like K Q on a flop of T J 3 will actually have a lower payout than a hand like 4 3 , even though 4 3 has made a "better" hand at that point. The important thing to remember here is that over the long run, K Q has a greater chance of winning the hand by the river, hence the lower payout when wagering on it. 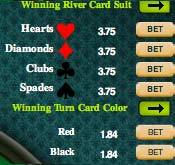 The payouts for betting on the turn card colour, the river card suit and kind of winning hand also vary. The payouts can increase and decrease depending on the cards that have already been dealt to the players or on the board.